What is a Serial Port? Applications of Serial Port. What Is Serial Port in Computer? 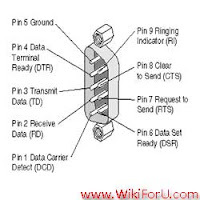 Serial Port is a communication port in the computer which uses serial data transmission technique for the transfer of data. This means that it is a communication interface through which the data or the information can be transferred in serial transmission mode i.e. One Bit per second. Also Read: What is Microcontroller and How it Works? Today, The modern personal computers do not utilizes this port as it uses serial communication method, thus was very slow. Now mostly all computers uses parallel port the communication of data. As parallel port is faster than serial port. The serial port is not used in personal computers anymore but it does not mean that it is of no use at all. It is still used in some Consumer Products, In Industries and Automation Systems etc. As its manufacturing costs are very low. Thus it is very cheaper than parallel port. And most of the times there are more chances of corruption of data in parallel port as compared to the serial port. A serial port also have the advantage that it requires very little supporting software from the host system. Also Read: What Is Address Bus, Data Bus, Control Bus?